Last week I wrote a post about potty training and how I got through it with my older two and how I'm still a bit nervous to do it all over again in a few months after my little one turns one. Not everyone will have the same experience. In fact, not every kid has the same experience as each kid is different, so you have to potty train them according to what works for them. It can be anything from aiming at fruit loops, like my son did, or using a sticker rewarding system, like I did with my daughter. Either way, don't put too much stress on your child or yourself to get them trained. If it takes a while for them to get the hang of it, it's okay. They will eventually get it. You all know that I've been a Kandoo Ambassador for the last two years. Not only is this a brand I've used and currently still do use with my kids, but it's also a brand I trust completely. I've been using Kandoo ever since my oldest who is going on ten, first started potty training. 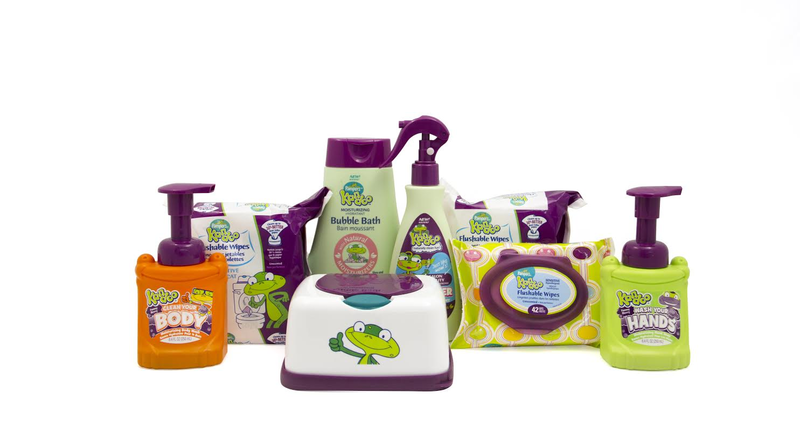 So to celebrate potty training month, we're partnering up with Kandoo and offering one of of Just Us Girls readers a Kandoo Prize pack that includes the entire line of Kandoo products! This is a perfect prize for any mom with little ones that are about to start potty training or even for those who have little ones who are already trained.